The Prime Minister of Vanuatu, the Honourable Nipake Edward Natapei, has committed his nation to a digital future, announcing that the young country will "establish a Country Programme of the innovative 'XO laptop' in schools in remote villages, starting from next year." He said the XO "will be used to improve schools' performance on basic skills such as literacy and numeracy, and also teach children new skills such as 'information literacy'." A former Minister for Infrastructure, Prime Minister Napatei made his announcement on OLPC after opening the PACINET 2010 conference, which has brought ICT experts from all over the region to the Port Vila to discuss the "next generation internet". Vanuatu has shown its appetite for technology and innovation in recent years with a rapid uptake in mobile telephony and the recent rollout of a national network to deliver e-government across the Melanesian archipelago of 82 mainly volcanic islands. Formerly known as the New Hebrides, the republic only gained independence from its former joint colonial administrators, Britain and France, in 1980, a unique history which has seen the country adopt three official national languages: English, French and the creole Bislama. The Honourable Prime Minister, Nipake Edward Natapei, today announced a new partnership to bring the One Laptop per Child (OLPC) initiative to the children of Vanuatu. The Prime Minister said the Republic of Vanuatu will partner with the Secretariat of the Pacific Community and the One Laptop per Child Foundation to establish a Country Programme of the innovative "XO laptop" in schools in remote villages, starting from next year. OLPC, which is mandated by Pacific Forum Leaders in the Pacific Plan, will be used to improve schools' performance on basic skills such as literacy and numeracy, and also teach children new skills such as "information literacy". 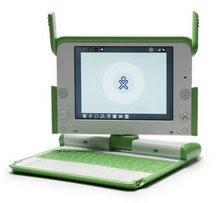 The eye-catching green and white XO laptops are rugged, low-cost, low-powered, and come loaded with safe, appropriate software designed for young children aged 6 to 12 years. The laptops can be adapted to any language: English, French and Bislama. One Laptop per Child Foundation is a global non-profit organization, dedicated to creating educational opportunities for the world's poorest children. Since 2007 it has distributed more than 2 million laptops in over 31 countries including Uruguay, Peru, Pakistan, Nepal, Rwanda and Afghanistan. Working with OLPC, the Secretariat of the Pacific Community has since 2008 helped established projects in eight Pacific Island countries: Cook Islands, Nauru, Niue, Papua New Guinea, Samoa, Solomon Islands, Tuvalu and Tonga. The governments of seven more Pacific countries have OLPC programs in development: Federated States of Micronesia, French Polynesia, Guam, Kiribati, Marshall Islands, and Palau. The PM said in Vanuatu this project would also contribute to bridging the digital divide in the country, boosting access for people in remote villages to education, health, information and other government services. The announcement came one day after he launched the PACINET 2010 conference, which has brought IT experts from all over the region to the Port Vila campus of USP to discuss the "next generation internet". The PM was joined by Mr Michael Hutak, the Oceania Director of the One Laptop per Child Foundation, who will address PACINET tomorrow. Mr Hutak said: "OLPC Foundation is proud to join with the Prime Minister and the people of Vanuatu in this effort to arm our children with the knowledge and skills they will need to inherit the world we are leaving to them." The PM said a proposal outlining an initial trial phase of between 1000 and 2000 laptops would be jointly submitted by the Prime Minister's Office and the Ministry of Education to the Council of Ministers for approval and seeking a resolution to confirm the partnership agreement. With work now underway on the new e-government network to link up the provinces and a revision of the education curriculum being planned, the PM said the time is right to introduce OLPC in schools, adding that this is the start of a long-term investment in our most precious natural resource: our children. Recent studies from the World Bank show access to the internet can significantly boost economic activity, adding points to economic growth. The PM said he would be working with Vanuatu's development partners to finance the project which would cost between USD250,000 and USD500,000, depending on the scope of year long trial. To design and implement the project, the government would draw on the expertise and technical assistance of the Secretariat of the Pacific Community through its leadership of the regional initiative One Laptop per Pacific Child. In the first phase the project would focus on remote islands coupling with another SPC program PacRICS, which provides satellite internet access to Pacific outer islands and other inaccessible locations.